After covering the Gangut, it’s time to look at another potential beast in that Russian battleships line. Here is the Pyotr Velikiy. So regarding the background for this ship, it is quite limited. According to Wargaming, she is based upon the Project No. 707 of battlecruiser. The project was presented at an international contest for designing an armored cruiser for the Baltic Sea by the Putilov Company, in cooperation with a German company. This is basically all we know about this ship. We are starting to see a bit more vulnerability against HE with the Pyotr Velikiy but overall, the ship presents solid armor protection. 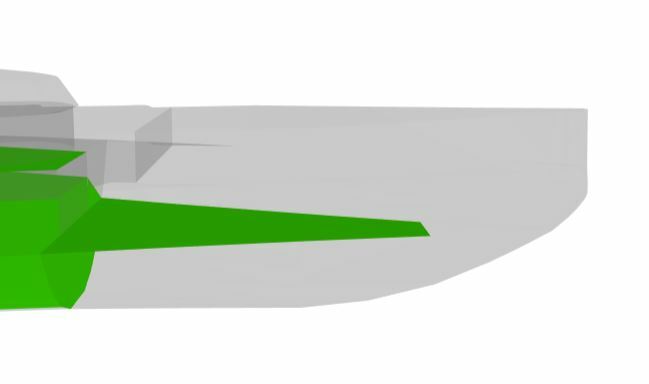 The bow’s deck is 38 mm thick, the upper part is 50 mm thick and the extended belt is, at first, 125 mm thick then it gets up to 180 mm. 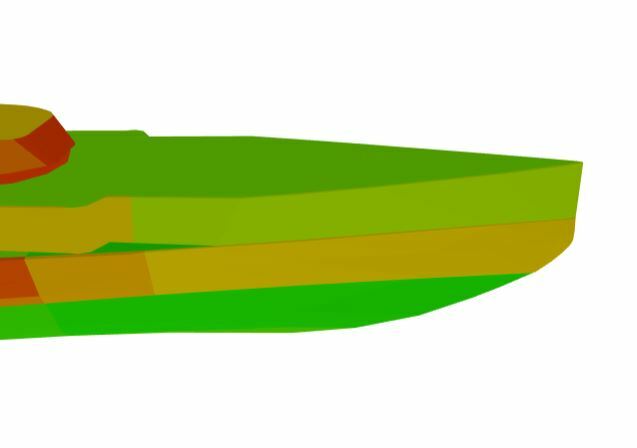 There is a tiny part of the bow that is only 19 mm thick (the little green portion between the upper part of the bow and the extended belt) but it will be quite challenging to hit it. Inside the bow, there are 2 armored decks. The upper one (on the left) is very short and only 19 mm thick and the lower one (on the right) is 25 mm thick. Considering that at this tier you start to face ships with 380 mm guns, these armored decks are not the greatest. Then again, when you see the exterior protection, it is not that much of an issue. 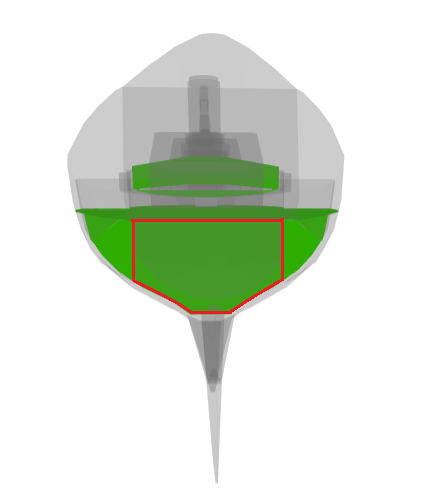 The lower part of the citadel’s athwartship (surrounded in red) as well as the casemate is only 25 mm thick. The upper part of the citadel (surrounded in black), as well as the casemate on the sides, are 250 mm thick. 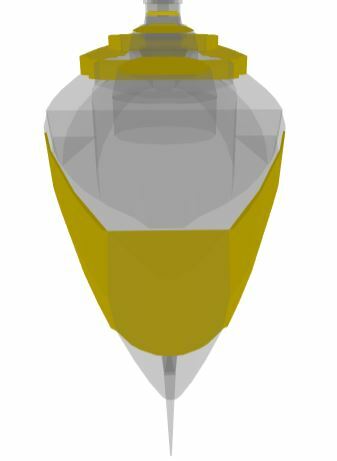 Considering that it’s the part above the water, it will definitely grant you good protection at this tier especially with the external armor on top. Finally, the upper casemate is 125 mm thick. This middle section will be very hectic to describe because a lot of parts are 25 mm thick which means that having a clear vision on them is not easy. So; for the external protection, the main belt in dark orange (sorry if there is a precise name for that color, I’m not really an expert on that) is 250 mm thick. That is quite fitting to her battlecruiser origins so be careful to what you are giving broadside to. The extended belt, as well as the lower part of the main belt, are 180 mm thick. For the upper casemate, there is a bit of everything. 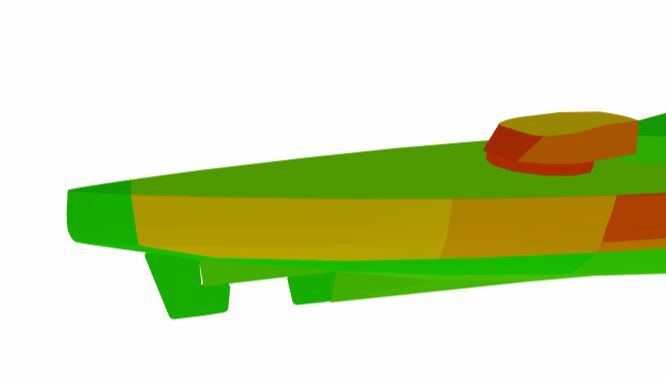 The deck is mainly 38 mm thick except between the 3rd and 4th turrets where the armor is only 19 mm thick for the deck and 25 mm thick for the sides of that section. The sides in yellow are 125 mm thick and just above, it’s a mix of (mostly) 25 and 19 mm platings. For the upper part of the citadel (protected in a spaced armor configuration) and the sloped armor of the turtleback, it is 50 mm thick. For the lower part of the citadel as well as its deck, it is only 25 mm thick. 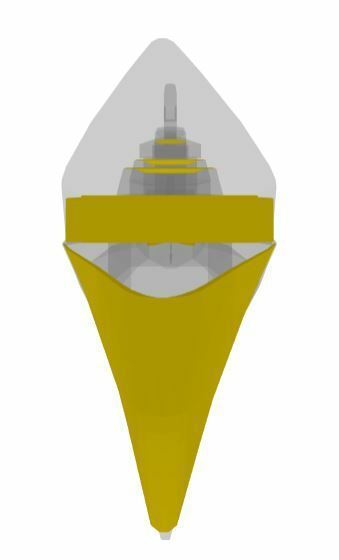 It is problematic because you might end up with ships with 380 mm shells or bigger penetrating the casemate and then overmatching the deck of the citadel. That weakness is actually a real problem that has to be noted. Just above, there are also two 25 mm decks. they won’t do much against AP bombs but they are here. For the stern, the deck is 38 mm thick, the sides are first 180 mm thick and then it goes down to 125 mm. 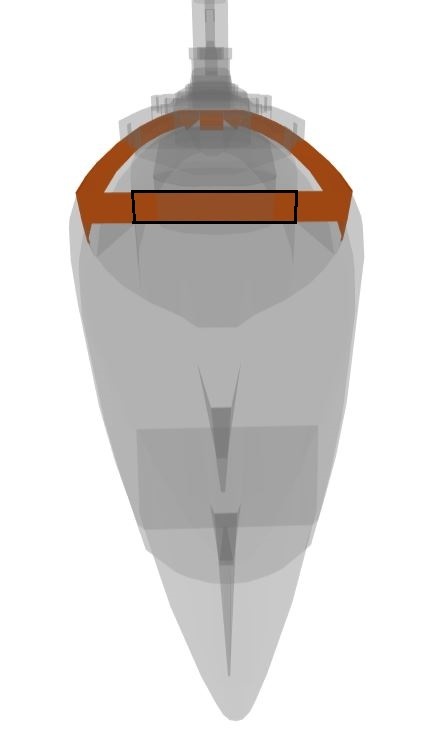 The tip of the stern is however only 19 mm thick. Inside the stern, there is an armored deck of 25 mm that protects the lower part of the citadel’s athwartship. There is also a relatively massive bulkhead at the tip of the stern. It is 125 mm thick. 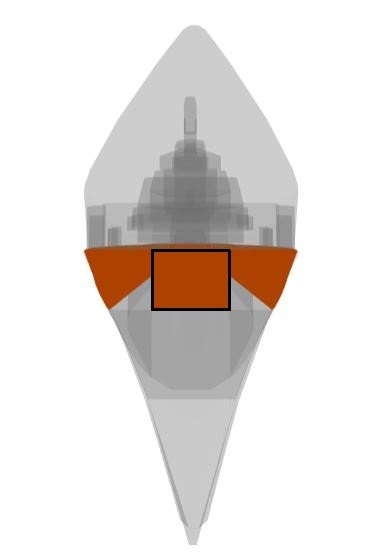 For the rear protection of the middle section, the upper part, including the citadel’s athwartship (surrounded in black) as well as the casemates on the sides, they are 250 mm thick. 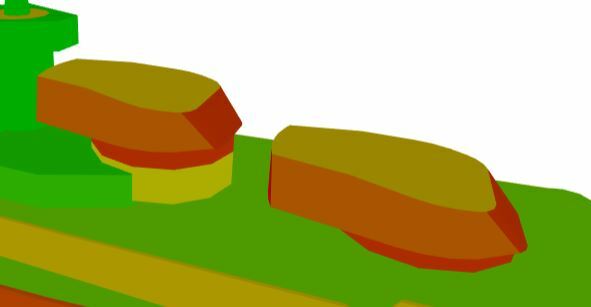 For the lower part, including the citadel’s athwartship (surrounded in red) as well as the casemates on the sides, they are 25 mm thick. For the superstructure, it is starting to have a decent size so the cruisers and destroyers will have something to shoot at. It is 13 mm thick. 275 mm on the face, 203 mm on the sides, 305 mm on the back, 125 mm on the roof. For the barbette, it’s 275 mm thick and then it goes down to 113 mm. This tier V’s armor is quite a mixed bag. The external protection is very good but at the same time, the internal armor for some parts is dangerously vulnerable. I mostly think about the citadel’s deck being only 25 mm thick.